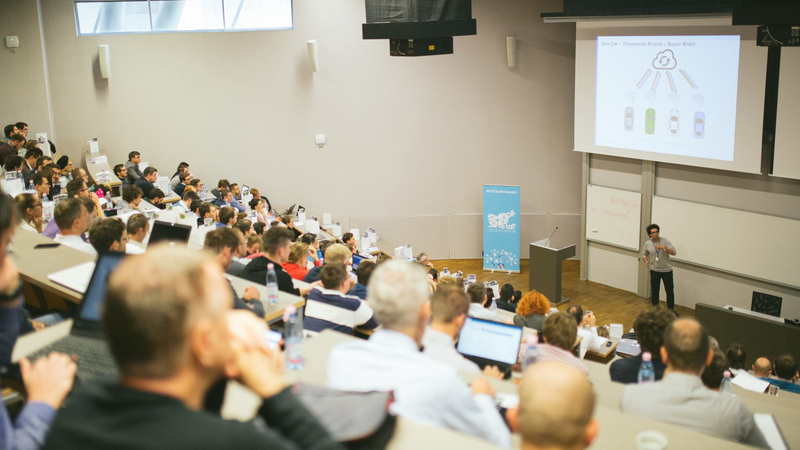 Karim Mansour, Co-Founder and VP Engineering and Simon Grabar, Co-Founder and CTO of SIGRA were invited to IoT Conference held on 25th Nov 2016 at the Faculty of Computer Science, University of Ljubljana to talk about the future of Autonomous driving and be a part of a panel to discuss enhance competitiveness of Slovenia in this field with Minister Koprivnikar and other representatives from Industry. In his presentation, Karim Mansour talks about the state-of-art of autonomous driving technology and the challenges involved in reaching Level 5 autonomy from currently commercially offered Level 2 autonomous vehicles. He talks about how this could be achieved with Deep Learning based approach and the power of such learning based approach being able to handle the corner cases that are hard to tackle using traditional algorithms. Karim Mansour presented the concept of Autonomous Driving on the IoT conference in Ljubljana.